Our frequently asked questions relate to the Dutch port solution for Brexit and the consequences Brexit will have on your transport. Since the impact on other (sub)areas is just as significant, please make sure to also consult the frequently asked questions of our initiating parties at the bottom of this page. How do I prevent ending up in front of a closed barrier at the terminal? Prior to your departure, use Portbase to verify the status of your customs documents at the terminal via the service Import Status or the Track & Trace Export screen of the service Notification Export Documentation. Register for these services at www.portbase.com/en/services/import-status and www.portbase.com/en/services/notification-export-documentation/. How does Brexit impact the transport of animals or animal products? Post-Brexit, many things will also change regarding the transport of animals, animal products, plants and plant-based products. Visit the website of the Dutch Food and Consumer Product Safety Authority to learn what to expect when importing or exporting animals and animal products. How does Brexit impact the transport of plants or plant-based products? Post-Brexit, many things will also change regarding the transport of animals, animal products, plants and plant-based products. Visit the website of the Dutch Food and Consumer Product Safety Authority to learn what to expect when importing or exporting plants and plant-based products. What do I have to do arrange with Customs and what with Portbase for each transport? You submit a customs declaration at Customs to notify them of the goods that you are transporting. Before you can submit a customs declaration, you need an EORI number. This is an identification number that your company has to request from Customs once so that you are known there. After you have submitted a customs declaration, you will receive a unique number from them (e.g. Movement Reference Number (MRN)) for the submitted shipment. You need this document number issued by Customs to pre-notify the customs documents at the terminal via Portbase. In Portbase, you link the customs data (MRN) to the required logistics data (which truck/container/trailer, terminal, times etc.). Portbase ensures that all the required customs formalities are automatically arranged for you at the terminal. This way, your transport can be performed without delay. Where are the buffer parking locations located? The buffer parking locations are only accessible to trucks that have been denied access to the ferry terminals because their cargo has not been (properly) digitally pre-notified via the Portbase system. At these locations, drivers can still arrange the required formalities or have this done. Noordoever (north bank): there are buffer locations at the Hoek van Holland site (Oranjeheuvel), in Maasdijk (Westland) and on Waterleidingstraat in Vlaardingen. 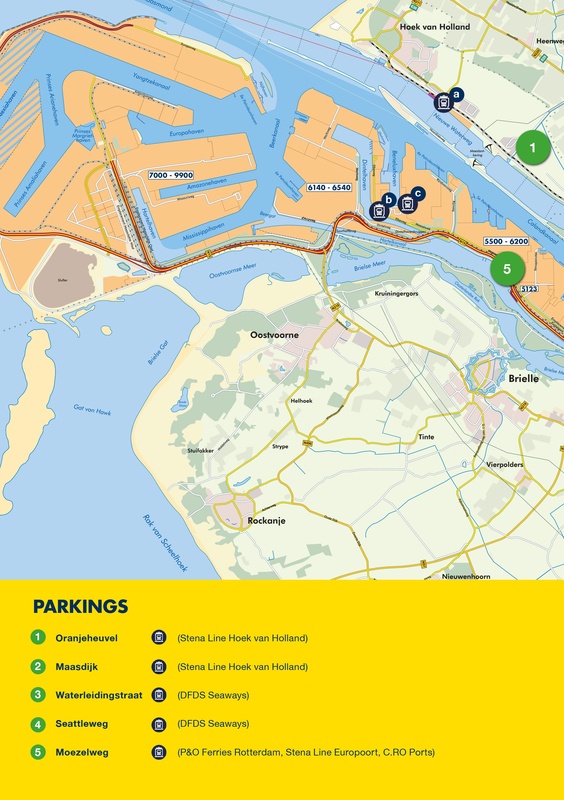 Zuidoever (south bank): buffer parking locations have been set up on Moezelweg and on Seattleweg (near the Europoort port area). Both sites are easily accessible from the A15 motorway, from both the east and the west. Why am I not granted access to the terminal and how can I fix this? Check or have checked whether the booking number is correct. Booking number not correct? Use Portbase to have the pre-notification of the customs documents at the terminal corrected. Booking number correct? Contact Portbase via servicedesk@portbase.com. Have a customs declaration filed with Customs. Next, have the customs documents electronically pre-notified at the terminal via Portbase. Have the customs documents pre-notified electronically at the terminal via Portbase. Contact the consulate or embassy of your own country. I cannot send my NID to the terminal. Why is that? Check whether the customer uses Notification Local Clearance or Transit Declaration. Both services currently only support container cargo at deepsea terminals for freight forwarders. This will be addressed in the short term. I cannot use a certain document type. Why is that? You are not authorised to use the document type in question at the relevant terminal. Check your terminal contract and adjust this in consultation with the sales department. I have missed the departure. Do the customs documents for my shipment have to be pre-notified again via Portbase? This depends on the applicable procedures at the ferry companies. As soon as your booking number changes, a correction will be required to the pre-notification of your customs documents via Portbase. The import document is not known at the terminal or is not in order. What causes this? Check the status of your notification: If the status is ‘rejected’ (by PCS or terminal) or ‘failed’, then the notification has not been accepted. Resolve the error message and resend the notification. Check whether the correct document number, document type and container/shipment number have been entered. If this is not the case, then enter the correct information and resubmit the notification. Check whether you have entered the correct terminal. It sometimes happens that cargo is shifted to a different terminal last-minute. This is not automatically changed in your Notification Import Documentation. Check in Cargo information 2.0 or Import Status whether your shipment or container has been unloaded. At some terminals, the import document only becomes available in the terminal system after the cargo has been included in the RTO (= Unloaded on the quay). If all information is correct, there may have been a (short-term) disruption at the terminal or PCS. Resubmit your notification. Tip: For the Brexit terminals, use the service Import Status to locate the presence and status of the import document before contacting the terminal or Portbase. What if the customs declarations are not in order? Before cargo can be imported or exported, an import or export declaration must be submitted to customs. After the declaration has been submitted, the documents must be pre-notified to Portbase. If these formalities are not in order, the driver is not able to continue with the transport of his cargo. The driver is asked to move to one of the temporary buffer parking locations. You can find these buffer locations here. 1. The driver contacts his own planner or client. He or she will have to ensure that all the required actions are performed. 2. Contact is sought with a company that is already affiliated with Portbase such as a forwarder or customs agent that can submit the notifications for them. What types of documents can I pre-notify? All types of customs documents can be pre-notified via Portbase (so export, TIR, ATA Carnets, Transit, etc.). Which statuses can I receive from the terminals? Not all deepsea terminals currently support an acceptance message. The final status for these terminals is ‘sent’ (AQ). For terminals that do support this message (ferry/shortsea) you will receive the status ‘accepted by terminal’ (AP) or ‘rejected by terminal’ (RE) within a few minutes. Does making use of the solution involve any other costs? That varies from service to service. For Brexit, 4 services have been developed that companies may have to deal with (also see portbase.com/en/services). Does using the export services involve any costs? No, when a company exports, it has to deal with the services Notification Export Documentation and Track & Trace Export. These services are free of charge because the terminals and shipping lines which are used to perform the export process bear these costs. Does using the import services involve any costs? When a company imports, it has to deal with the services Notification Import Documentation and Import Status. Subscription costs and transaction fees apply to the service Notification Import Documentation. The subscription costs for a web screen (so a log-in via the internet from a computer, laptop or tablet) amount to € 6.12 per month and a system link-up (so between the system of the customer and Portbase) costs € 20.43 per month. In both cases, a transaction fee of € 0.18 per transaction (per message) is charged (transaction costs). How does the ‘digital border’ work? The ‘digital border’ via Portbase means that if all parties participate and adhere to the agreements, there is no need for Customs to manually check compliance with the customs formalities. As a result, transport through the Dutch ports becomes must faster. It is easier for parties to meet the legal customs obligations and they know in advance whether the ‘barrier’ at the border will be open. The concept of a ‘digital border’ is not new. At the deepsea container terminals, customs formalities have already been processed in an automated manner via Portbase for many years and this ‘digital border’ works to the full satisfaction of all parties involved. All information precedes the cargo and there are no delays and congestion at the terminals. The approach used for deepsea container transport served as the blueprint for the project for ferry and shortsea transport; Portbase plays a central role in this. How long does it take before you receive the Portbase login details after registration? This depends on the service, but normally 24 hours. Portbase performs a due diligence check. Despite the fact that Portbase has scaled up, it may take longer if there is a peak in registrations. I have registered with Portbase but I have not yet received any login details? Please contact the sales department of Portbase at sales@portbase.com to check the status of your connection. Until you have received your login details, you can ask another party in your chain to pre-notify the customs documents for you via Portbase. What are the costs for the service Import Status and why is it so important? Import Status is a free service that has been specifically developed for transporters. This service offers insight into the status of the customs documents for import shipments at the terminal. The costs are borne by the terminals because they make pre-notification via Portbase mandatory. This service is highly important to transporters as it allows them to see whether the customs documents have been correctly pre-notified at the terminal. If that is not the case and they still proceed to the terminal, transporters will find the barrier closed there. What is this Port Community System of Portbase? Portbase is a subsidiary of the port authorities of Rotterdam and Amsterdam. The company was established in 2002 with the aim of making the Dutch ports smarter and more efficient. Portbase digitally connects all the parties in the port, both business-to-business and business-to-government. Portbase is neutral and has no profit motive. The digital infrastructure is funded by the port companies. The costs for usage are partially passed on to the users, the companies that benefit the most. Where can I find Portbase on the internet? Go to www.pcs.portbase.com. Log in with the details that you have been provided. Why are connection costs being charged? Connection costs are charged because a number of steps must be completed in order to make use of the ‘digital border’ via Portbase. Portbase is a cost-effective organisation. Due to the hiring of extra capacity to accommodate the rush of registrations for a possible no-deal Brexit, the connection costs have been temporarily increased from € 249.50 to € 499. Should Brexit be postponed for a longer period of time (for example if a deal is reached), then the extra capacity will be scaled down and the regular connection rate will once again apply. Why are costs charged for the service import but not for the service export? The costs for the import process in terms of security, liability and the amount of connections that need to be made (ICT costs) with various parties are much higher than for the export process. Notification Import Documentation results in a faster and more efficient process for companies involved in imports and logistics. These costs are not fully covered by the terminals and shipping lines (due to the added value for importing companies). Because of its cost-based and non-profit basis, Portbase has no other option but to pass on these costs to the user. Why is the use via Portbase mandatory? Together with ferry operators, shortsea terminals, interest groups, port companies and Customs, a post-Brexit solution for the handling of customs formalities has been explored. The conclusion: the only solution is a digital solution. With its existing method for deepsea container transport, Portbase manages this digital solution. After all, the handling of these customs formalities would be highly time-consuming without a digital solution, with hours of queues at terminals and on the access roads. This would cost the business community much more than the current investment to link up with this method. The moment the United Kingdom (UK) leaves the European Union (EU), a border is created and customs formalities will have to be performed. This automatically means that parties in the logistics chain will become dependent on each other. One party will need to use the data of another party to perform its next steps. The exporter or importer will have to ensure that Customs is provided with a customs declaration. That is the first step. Without a customs declaration, it is not possible to pre-notify customs documents at the terminal and the cargo – and therefore the transporter – will by definition come to a standstill at the border. Think of it as checking in online at the airport. In order to do this, a ticket will first have to be booked. You can next use that ticked number to check in in advance; once you arrive at the airport, the check-in has already been arranged digitally, allowing for a smooth passage. What if Brexit is postponed or cancelled altogether? If Brexit is postponed, the situation will not change. Customs formalities will still be introduced for imports and exports from and to the UK in the future. Companies should consider the connection costs a no-regret measure, because customs formalities will become relevant no matter what, now or in the future. If Brexit is cancelled altogether, Portbase will have carried out the activities associated with the registration process, which means the costs will have been incurred. Does the collaboration relate to the process on the UK side as well? Does this collaboration fully prepare the Netherlands for Brexit? Nobody will be fully ready for the impact of Brexit. Not knowing whether a deal will ultimately be reached makes it difficult to fully prepare a final solution. By means of this collaboration, the parties involved want to at least make sure that the ferry chain can continue to function and that no congestion occurs at the border should the worst possible scenario play out. Does this not mean that it would be better for companies to wait to connect? The ports and government bodies have already been communicating for some time now that companies need to prepare. Since January, companies have been warned of an increase in connection costs shortly before the Brexit date. Preparation is essential for everyone, but also an individual responsibility. Companies that still decide to wait cannot import and export via the Dutch ports if there is a no-deal Brexit on the 12th of April. That is their own choice. How do you make use of the solution? In order to make use of the solution via the Dutch ports, it is important that companies register with Portbase. The ferry terminals have decided that without pre-notified customs documents via Portbase, the driver will not be granted access to the ferry terminal, meaning the cargo cannot be transported. This approach is embraced by the shortsea terminals as well. Only in this way will the ’digital border’ function and ensure a speedier procedure compared to labour-intensive manual inspections. Registration with Portbase is required in order to pre-notify documents. A one-off registration which ensures a smooth flow. Before pre-notification, the process involves steps that are beyond the scope of Portbase. Companies will have to arrange those steps among themselves and with Customs. What are the Dutch ports doing in preparation for Brexit? It has been acknowledged in the Dutch ports that all the parties in the chain are dependent on each other. To prevent chaos at the border, a broad partnership has been established under the name ‘Get Ready for Brexit’. Only if all the parties in the chain work together and take their own responsibility can they prevent delays together. This chain-wide solution has been jointly developed by interest groups Transport en Logistiek Nederland (transporters), FENEX (forwarders), evofenedex (importers and exporters), the Port Community System Portbase, the ferry operators, the shortsea terminals and Dutch Customs. This chain-wide collaboration is supported and largely financed by the port authorities of Rotterdam and Amsterdam. What are the starting points of the solution? The project members have developed a method that comprises the fully digital and automated handling of customs formalities, with optimum reuse of data. All information precedes the cargo in the process, so that the next party in the chain has timely access to the required data. For both shortsea and ferry traffic, one digital gateway (via Portbase) is created for all terminals, resulting in a central working method for everyone. This allows for smart supervision on the part of Customs, with minimal disruption to the logistics process (the digital border). Will this give the Dutch ports a competitive advantage over other European ports? If all parties in the chain assume their responsibility, handling from and to the ports will become more efficient. This increases reliability. We also see this in deepsea container transport, where a similar solution has already yielded an excellent logistics process for many years. Will this solution lead to fewer customs inspections? Customs performs risk-based inspections. As part of this, it also verifies whether the correct formalities have been completed (e.g. the presence of an export declaration, otherwise the shipment is prohibited from leaving). The solution will consequently not lead to a reduction in the number of inspections. The starting point of Dutch Customs is smart supervision with minimum disruption to the logistics chain, under the assumption that all formalities have been completed. The automated process makes this possible. Can I already request an EORI number to replace my GB number? After Brexit, all GB EORI numbers will expire for use in the EU. A customer must of course have an EORI number in a company in the EU in that case. It is highly likely that the company’s headquarters will be located outside the EU. These companies can consequently use the form for companies that are headquartered outside of the EU. The department that processes these applications will wait until they are able to issue the EORI number (in principle when the GB EORI numbers expire, because only one valid EORI number is allowed in the EU). PLEASE NOTE! The EORI application is processed faster if the company already has a Dutch tax registration number. The customer can request this in advance via this form. Can I compile an EORI number myself or do I have to request one? You can only compile an EORI number yourself when you submit declarations in the Netherlands. Should you start submitting declarations abroad, you must request an EORI number. Since you are going to submit declarations outside the Netherlands because of Brexit, you must request an EORI number. Do I also have to apply for an EORI number in Great Britain? In the case of a hard Brexit, EU companies will have to apply for an EORI number in Great Britain in order to be able to enter it. Great Britain has chosen to continue with the ‘EORI number’ principle. This is a GB EORI Number. These UK EORI numbers can only be used in UK software and not in EU software because these numbers are no longer valid within the EU. This issue is therefore completely separate from the EORI number that the customer must have in the EU in order to trade in the EU. How can I request an EORI number? First of all, check here whether an EORI number has already been allocated. The EORI number is derived from the VAT number. This means the VAT number can be entered on this site, without B01. There are 2 application forms on this page of the Dutch tax authorities; one for companies headquartered in the Netherlands looking to apply for an EORI number and one for companies which have their headquarters outside the European Union. TAKE NOTE! It is important that the form is filled in digitally. In addition, an EORI number cannot be issued to a tax entity, but it can be issued to the underlying entities. Furthermore, the company must be of valid legal status as well. How long does it take before I receive my EORI number? The EORI number is issued within 3 working days. The confirmation letter will be sent within a week. If the customer already wants to check the EORI number, this can be done via this site. PLEASE NOTE! This lead time only applies to companies that already have a tax identification number in the Netherlands. If the customer does not yet have a tax identification number in the Netherlands, the lead time is 2 weeks on average.